Bayer CropScience LP and BASF Corp. filed the most requests for breaks in duties for imports not manufactured in the U.S., showing that the chemical manufacturers continue to rely on inputs not available in the U.S. 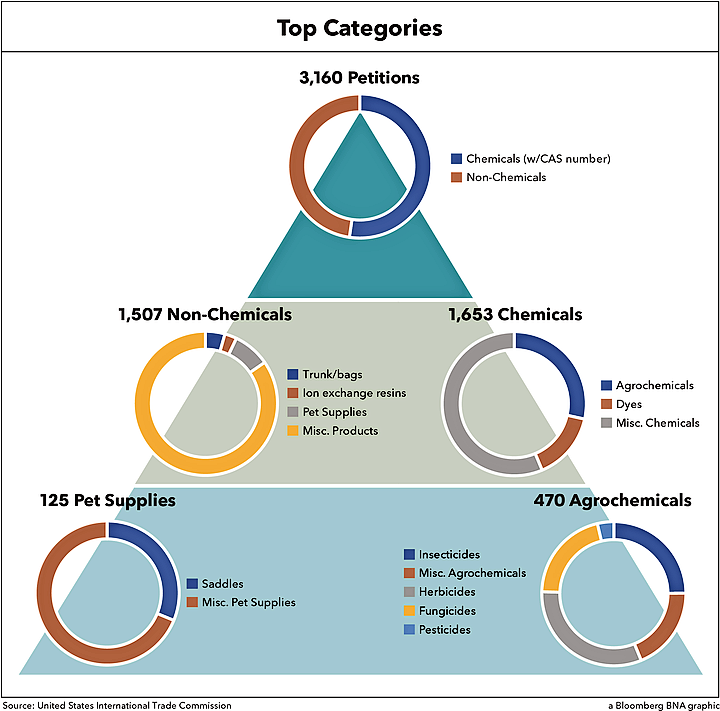 Agricultural chemicals such as herbicides, fungicides, and pesticides dominate the list of products for which companies request tariff breaks in petitions filed with the International Trade Commission, a Bloomberg BNA analysis of ITC data shows. To date, Bayer has filed 126 requests and BASF has filed 107. The next five companies with the highest number of requests for tariff breaks are PetSmart Inc. (96), W.L. Gore and Associates (62), 3V Sigma USA Inc. (57), Syngenta Crop Protection LLC (56) and LANXESS Corp. (55). The American Manufacturing Competitiveness Act of 2016 gave the ITC a key role in the miscellaneous tariff bill (MTB) process, which had been stalled for years over earmark concerns. The agency will look at petitions filed and make recommendations to Congress in preliminary and final reports. Products that qualify will be bundled eventually into legislation for congressional approval. In the meantime, interested parties, such as domestic manufacturers, may support, object, or provide other comments on the petitions. The window for comment to the ITC closes Feb. 24. The MTB process is aimed at giving U.S. manufacturing a boost by allowing companies to import products not produced in the U.S., without paying nuisance tariffs. Chemical manufacturers rely on raw materials for innovation. But many of these are not produced in the U.S. The American Chemistry Council (ACC)—in an e-mailed statement—said it is a strong supporter of the MTB process since it enables the duty-free import of chemical inputs not produced domestically, and allows U.S. manufacturers to create value-added products. “As a globalized industry, initiatives such as the MTB can be very useful in helping companies to capitalize on global supply chains, many of which are intra-company,” the ACC said. To qualify for tariff exemptions or reductions for a period of up to three years, the imports must not otherwise be available in the U.S. Domestic U.S. producers can object to the tariff breaks if they produce the same product. An industry official, who spoke to Bloomberg BNA on background, said agrochemicals have represented the majority of MTB petitions historically. The companies that have traditionally used the process tend to be European heritage firms, he said. “In many cases these companies are doing global sourcing and the precursor chemicals are manufactured abroad,” he said. The countries that many of these companies are sourcing from include Germany and Switzerland, which do not have free-trade pacts with the U.S., he said. Trade attorney J. Michael Taylor, King & Spalding LLP, Washington, told Bloomberg BNA that products that can be defined by molecular structure lend themselves to detailed descriptions under the MTB process because an imported chemical product easily can be compared against the description under highly technical provisions in the tariff schedule. In his view, this dynamic has resulted in a larger number of chemical products being listed in the MTB. “As a corollary, this dynamic also has allowed companies that trade in chemicals to maximize their duty deferrals, since the duty-deferral caps are set on a defined-product basis,” he said. Some of the petitions filed cover finished products as opposed to intermediate products, the industry source said, pointing to a petition filed by Whirlpool Corp. The statute does not bar this, he said. Chemicals, in general represented over 52 percent (1,653) of the submitted petitions, and 28 percent (470) of those were agrochemicals. Of those agrochemicals, almost one-third (155) were insecticides. U.S. chemical manufacturers produce 15 percent of the world’s chemicals and account for 14 percent of all U.S. exports, according to the American Chemistry Council. Besides agrochemicals, dyes made up 8 percent (252) and pet supplies were 4 percent (125) of all petitions. But few other categories showed up repeatedly. 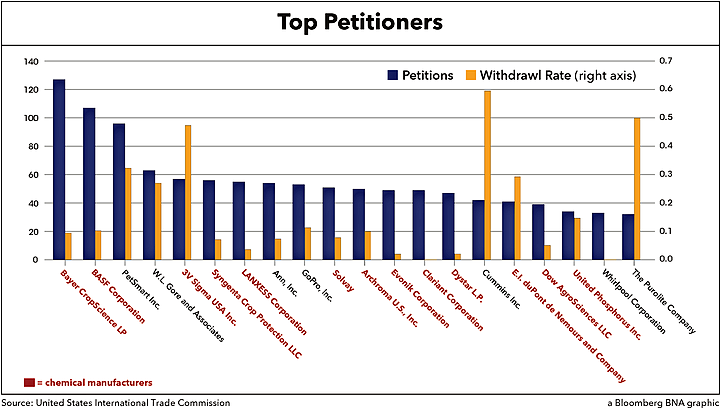 Chemical manufacturers were less likely to withdraw their petitions. Around 13 percent of chemical petitions were withdrawn, whereas for other products it was around 22 percent. One exception was DuPont, the global chemical manufacturer, who withdrew around 30 percent of their petitions. Cummins Inc., an Indiana diesel and gas engine manufacturer, made 42 applications but withdrew over half of them. Under the new ITC process, petitions couldn’t be amended once filed to make corrections. An industry source speculated that some of the withdrawn petitions were resubmitted to either correct information or add information that wasn’t included in the original filing. “Kudos to the staff of the Trade Commission,” Taylor said. “A significant volume of new data is being thrown at them but they seem to be managing well and asking the right questions,” he told Bloomberg BNA. The comment period for the tariff bill petition system has only been open for less than two months, and the ITC has received 230 entries so far. Of those entries, comments on Bayer’s agrochemicals and PetSmart’s leashes and other pet supplies were the most prolific, with 23 and 22 entries respectively. Domestic chemical and pet supply companies objected to the exemption requests on the grounds that they produced an identical product. Potentially the most contentious petitions were three made by retail clothing store Ann’s Inc. for handbags and one by granite memorial manufacturer Great River Granite Company’s exemption request for rough-cut granite blocks. Each of those requests received four notices that other companies produced similar handbags and quarry blocks that would directly compete with the imports.